After revealing evidence of electoral campaiging for Armenia's ruling party by public sector employees, this NGO is facing a defamation suit and attacks in the press. Supporters of the The Armenian Revolutionary Federation (ARF) march in Yerevan ahead of Armenia's parliamentary election on 2 April. (c) NurPhoto/SIPA USA/PA Images. All rights reserved.Last month, Armenia held its watershed parliamentary election, initiating the country’s transfer to a parliamentary form of government. The process will be completed after next year’s presidential vote, when the president’s post will become largely ceremonial, while parliament will form a government that will hold full executive powers. An opposition party has unsuccessfully challenged the legitimacy of the elections in the Constitutional Court, and the newly elected parliament is set to convene on 18 May. So although the dust hasn’t fully settled yet on the post-election outcome, it’s a good time to take stock of the election itself. The story of one Armenian nongovernmental organisation’s efforts to expose the involvement of public school staff in campaigning and recruiting supporters for the ruling party paints a vivid picture of what that pressure looks like, and the retaliation people face when they try to uncover it. Ten days before the 2 April vote, the Union of Informed Citizens published an expose about an unorthodox experiment its staff conducted. The Union of Informed Citizens is a local nongovernmental group, established in 2013, which raises public awareness about policy issues and promotes informed decision-making. Its donors include European Endowment for Democracy, Open Society Foundations, National Endowment for Democracy, and others. 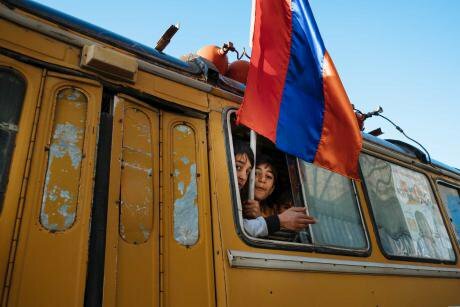 As part of the experiment, the group’s activists had called 136 public school principals and preschool directors across Armenia, pretending to be representatives from the ruling Republican Party, inquiring about the preparations for the polls. The group said that 114 of the principals admitted collecting lists of schoolteachers, preschool staff, and parents of students who pledged to support the Republican Party at the polls. These lists, the unsuspecting respondents said, were submitted to local municipalities and the ruling party campaign offices. The Union of Informed Citizens also publicized audio recordings of the phone conversations. While the ruling party acknowledged that school officials had indeed compiled the lists, they insisted that it was part of legitimate campaigning, as it did not occur during work hours. The Central Election Commission supported the official position, claiming that there was not enough evidence that administrative resources had been used in the process of drawing up those lists. Everyone seemed to demonstratively ignore the obvious: that the party’s access to such lists, which teachers and principals have thanks to their positions, is the issue. Plus, of course, the unspoken pressure that the authorities put on school staff who need their jobs. As the authorities swiftly dismissed the allegations, and a concerted campaign to discredit the Union of Informed Citizens and its leader, Daniel Ioannissyan, soon got underway. A day after the expose was published, an online news agency published an article revealing certain private details of Ioannissyan’s family’s private life, which, according to Ioannissyan, could only have been found in police records. Several weeks later, the authorities opened an inquiry into possible breach of Ioannissyan’s privacy, but have not yet identified any suspect in the case. Also, on 10 April, the principals of 30 public schools and kindergartens sued the Union of Informed Citizens and Ioannissyan personally, seeking a formal apology and total of 60 million drams (over £95,000) in damages to their honor and dignity. While one could take issue over how the Union of Informed Citizens went about obtaining the information from the schools, it is also clear that what they were exposing was of high public interest. International norms provide extra protections for people who expose certain kinds of abuse when that information is in the public interest. These protections grant whistleblowers leniency for breach of other laws, such as privacy, or even national security. Unfortunately, Armenia’s civil defamation laws don’t include public interest defense arguments, leaving a gap in the legal protection that should exist to safeguard the importance of freedom of expression on matters of public interest. The authorities have a responsibility to protect groups like the Union of Informed Citizens when exercising their right to impart information in the public interest. If the defamation suits are successful, they will no doubt inhibit future efforts by activists to expose entrenched, hidden abuses. Armenia needs more transparency, and more protection for people who expose potential political misdeeds or abuse of public resources. And more activists like the Union of Informed Citizens.